I'm getting beyond a simple MVVM program now, and I'd just like to sense check my current architecture and makes sure I'm going down the right path here. Everything is structured around screens, and these screens have a kind of "tree" breakdown. On the top level there's a home screen, and you can drill down through related screens. I've made a simplified example, an application that tracks employees for companies. It has three "screens". EmployeeScreen, let's you see information about an employee. Question 1: Where should these screen view models be created and stored? Should they be created and stored in one place above everything, or should the EmployeeTrackerScreen ViewModel create the EmployeeScreen ViewModel and store it as a collection property? I'm also using shared ViewModels that don't have views for the data and UI properties in these screens where they are displaying a collection of items. For example, the EmployeeTrackerScreenView has an ItemsCollection to directly bind to an ObservableCollection that are stored as properties in the EmployeeTrackerScreenViewModel. Question 2 Is in line with MVVM patterns? Am I going about it the right way? I'd love some comments on how I'm structuring things, perhaps some advice on whether I'm going about it in a sensible way. I hope the question provides enough information and is appropriate. I'm new to this kind of software design, I've always made smaller apps in the past, so I'm inexperienced in proper architecture. I've been using Caliburn Micro MVVM framework, in WPF if that's useful to know. Normally I have one overarching ApplicationViewModel that takes care of initializing ViewModels for separate screens, like this, however because of the nature of your application, it sounds like your CompanyOverviewScreenViewModel should work fine for this purpose. Typically I would have is my main application initialize the top-level data context, and each ViewModel from there is in charge of creating/maintaining viewmodels below it. 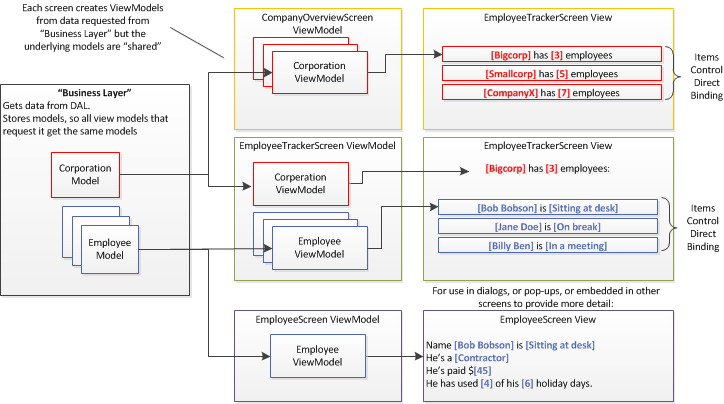 The CompanyOverviewScreenViewModel would contain a collection of CompanyModel objects, and upon selection each CompanyModel object would be displayed to the user in some kind of ContentControl or UserControl. Each CompanyModel would further have a collection of EmployeeModel objects that could also be selected and displayed. Keep in mind that a ViewModel is really just a model of the View. For example, it sounds like you only want to display Employee objects, so using the EmployeeModel directly is perfectly acceptable. But if you wanted to provide the ability to update the EmployeeModel and include items like Save, Cancel, Delete, etc you would probably want a ViewModel to contain the extra code that is unrelated to the Employee data object itself. 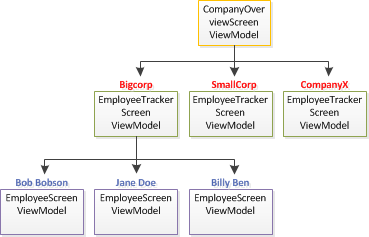 In that same vein, because you want to do things like track the Selected Employee of each CompanyModel, something not normally part of the Company data object, it might make sense to use a CompanyViewModel object at that layer too. Sometimes for something as simple as just tracking selection though, I'll just add it the object model. It really depends on how big or how structured the application is. Overall what you have now looks like you're going in the right direction, although I did have some concern about your image where it says "Each screen creates ViewModels.." in the top left corner. I typically do not advocate for a view-first approach to MVVM and WPF, and would recommend a ViewModel-first approach instead, as I described here. I would suggest to encapsulate your view model's creation process from the screen. You can introduce the class that will use models to create related view model. This class can collect/sort/filter and provide ready-to-show array with view models. About where to store viewModels, I don't see any problem to store what you show in your screen. Or if you have separate dataSource class for your screen you can store viewModels array there. I can only share some thoughts about the conceptual design of your problem. I will leave the code to use as I am not familiar with the frameworks. An important note first; the ViewModel, as others have said, is the model of a view. This, consequently, means that you can have one viewmodel per view. Now, don't confuse views with screens or forms. In a screen or a form or a window, you can have several view. For example, say that in one of your employee screens you have a kind of dashboard with a chart about the taxes or insurance they pay and a list with the benefits they receive. The chart and the list are two different "views" which means that you need two viewmodels to prepare the dataset(s) for the two views. Where should these screen view models be created and stored? Should they be created and stored in one place above everything, or should the EmployeeTrackerScreen ViewModel create the EmployeeScreen ViewModel and store it as a collection property? In order to figure this out, you need to consider who is responsible to show the Tracker Screen window/dialog? There is a kind of debate in the MVVM community regarding the question you are asking. I am going to take a pragmatic approach here. If your View and the ViewModel are short-lived (like in the EmployeeScreen View in your figures) you can create the ViewModel at the same place you create and show the actual window (the View). If you are talking about an application-wide viewmodel (something you need all the time) then you can do what Rachel says. Again, you can get different approaches on this. Another approach for the application-wide models and viewmodels would be to have a factory that generates the instances of the classes and a service locator before even you show the main window of your app. There is, also, controversy whether the service locator should be favored or not. On this, I suggest you do your own reading and see which arguments suit you. I am not familiar with Caliburn Micro MVVM framework, If you are open to another framework, I will advice you to use PRISM from microsoft (https://msdn.microsoft.com/en-us/library/gg406140.aspx). With PRISM you can easily display and manage your views(Screen). Not the answer you're looking for? Browse other questions tagged design architecture mvvm or ask your own question. Silverlight 5 and MVVM. Do I really need other frameworks? What is the best way for rapid development?